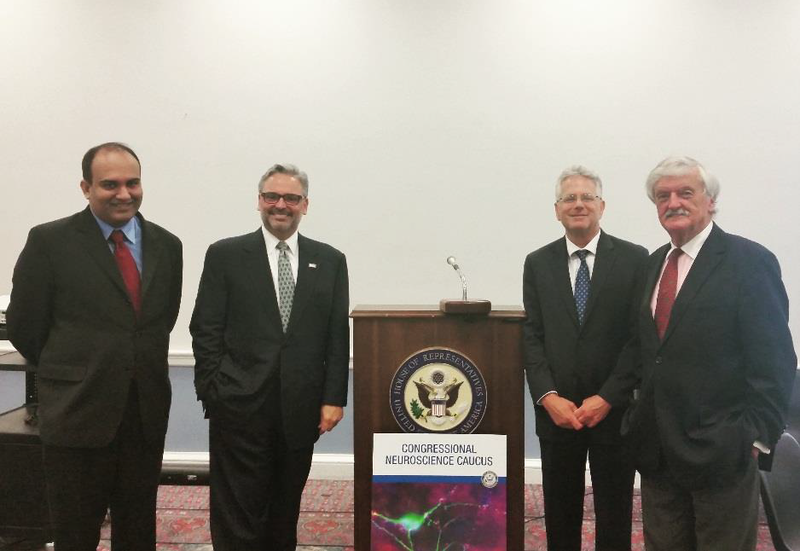 On September 10, 2015, the Congressional Neuroscience Caucus hosted a briefing highlighting the work of GE, Inscopix, and the Brain & Behavior Research Foundation to support the goals of the Brain Research through Advancing Innovative Neurotechnologies (BRAIN) Initiative. The briefing was organized and co-hosted by the American Brain Coalition and sponsored by Inscopix. Speakers showcased how private investment is complementing the public effort being made to find the missing puzzle pieces needed to understand the mysteries of both the functional and dysfunctional brain. Robin Elliott, Chair of the American Brain Coalition and President of the Parkinson’s Disease Foundation kicked off the event describing the BRAIN Initiative and its approach to tackling the complexities of the “most challenging organ.” The overall goal of the BRAIN Initiative is to fill major gaps in our current knowledge and provide unprecedented opportunities for exploring exactly how the brain enables the human body to record, process, utilize, store, and retrieve vast quantities of information. Since the Initiative’s launch in 2013, federal agencies including the National Institutes of Health, the National Science Foundation, Defense Advanced Research Projects Agency, Intelligence Advanced Research Projects Activity, and the Food and Drug Administration have joined efforts. However, significant contributions by private partners also being made leveraging expertise and resources to give scientists the tools to overcome the significant hurdles that exist in neuroscience research. Alan Gilbert, Director of Global Government and NGO Strategy of GE’s healthymagination, noted that GE has invested in brain related activities and medical innovations for quite some time. He explained that their efforts are largely focused on improving imaging technology, biomarker development, and combining these with new data analytics. GE has make news recently as a result of their partnership with the National Football League (NFL), Under Armour, and the National Institute of Standards and Technology. Their collaborative work aims to advance the development of technologies that can detect early stage mild traumatic brain injuries and improve brain protection. Mr. Gilbert shared that they have invested over $60 million to award researchers across the United States as part of this effort and have committed to having new devices developed by 2017. He noted that while these devices will be optimized for evaluating patients with concussions, the technology can be applied to other neurological and psychological diseases and disorders. Even with significant public and private investments, Mr. Gilbert relayed that there are still many barriers to address, especially data sharing and analytics issues as a result of the tremendous amount of information that is being generated by BRAIN Initiative efforts. In order to address data sharing challenges, GE has partnered with the Allen Institute and Kavli Foundation, two entities famous for their involvement in neuroscience research, to conduct a pilot study that will establish an effective and efficient way to share massive amounts of data generated during imaging studies. The study in now entering into phase II and will begin working with data generated from the human brain. The BRAIN Initiative has also created significant opportunities for small startup companies like Inscopix. The Initiative has propelled the technologies created by this U.S.-based company forward into over 100 neuroscience labs. Dr. Pushkar Joshi, Director of Strategy & Business Development, showcased Inscopix’s nVista, a microscope the size of a thumbnail that can be used to stream live, high-definition videos of large-scale neural activity in awake, naturally behaving animals. Using video of active neurons lighting up during the briefing, Dr. Joshi demonstrated nVista’s ability to allow researches watch the “brain in action.” Inscopix has committed to not only advancing this device, but training researchers on this next generation technology, another one of the BRAIN Initiative’s core goals. Dr. Joshi emphasized that the new world of neuroscience is more transdisciplinary than ever, requiring expertise from many fields including physics, data science, and engineering. Young scientists will have to learn new techniques and be skilled in working in teams of experts to accomplish what everyone hopes will come of the BRAIN Initiative. Inscopix is also using their success to fund research through their DECODE (Deciphering Circuit Basis of Disease) Grant program which was created in response to BRAIN Initiative’s launch. The Brain & Behavior Research Foundation is also funding cutting edge neuroscience and giving young scientists a platform from which to launch. Dr. Jeffrey Borenstein, President & CEO of the Brain & Behavior Research Foundation, relayed that they have provided millions in seed funding through their NARSAD Grant program to young, independent and distinguished investigators with innovative ideas. Their program focuses on three priority areas: basic research, new technologies, and new generation therapies. The NARSAD program is made possible because private donors have come together with leading neuroscience experts to find and support the best and the brightest. The Brain & Behavior Research Foundation has supported the early work of Karl Deisseroth, which lead to the development of optogenetics, and Helen Mayberg, who is using deep brain stimulation to help those with treatment-resistant depression. These are two technologies that have revolutionized the way that neuroscientists are able to approach studying and treating diseases and disorders of the brain. Just this year, the Brain & Behavior Research Foundation will give awards to 400 young, 50 independent, and 15 distinguished investigators. In addition, Dr. Borenstein relayed that public education will be vital to its success as the BRAIN Initiative continues into the future. In order to elevate public awareness on neuroscience efforts, the Brain & Behavior Research Foundation holds three public webinars per month and has launched a television series call “Healthy Minds” which aims to reduce the stigma and share personal stories of those with mental health issues. 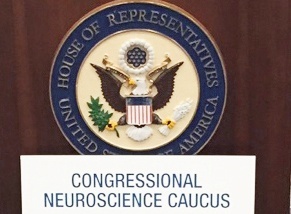 This event was one of several briefings hosted by the Congressional Neuroscience Caucus on the BRAIN Initiative. The Caucus is co-chaired by Reps. Earl Blumenauer (D-OR) and Cathy McMorris Rodgers (R-WA). Rep. Blumenauer was able to attend the event briefly to thank those who attended and urge the Congressional members represented in the room to join the Caucus. He further relayed the commitment that the Neuroscience Caucus has for sharing the important brain related work occurring across the United States. Attendees filled the Rayburn room and consisted largely of staff from Hill offices, in addition to federal agency officials, ABC members, and neuroscientists interested in the BRAIN Initiative.